When are we likely to come across them, where are we likely to find them, and what species could we expect to find? In South Africa as we all know, electricity kills many people annually. Same for cigarettes, motor vehicles and water. Chicken bones can be lethal, along with most other things we put in our mouths – choking is a common cause of death. I won’t bother to add how many humans are killed by other humans. We’re talking death in the thousands here folks – every year! So take care next time you climb out of bed. Oh, sorry. I nearly forgot. Some of the snakes that live amongst us, can also kill people– up to ten or twelve perhaps, in a year. Spot the difference. Problem? Snakebite is one of those things that we can largely avoid – if only we’d just wake up and understand the rules. Here we go again, you might sigh, but please humour me. Hospital food is not all it’s cracked up to be. Rule 1. If you see one, stand still, observe. Outdoors, let it continue on its way. Rule 2. Don’t pick it up. Rather take a picture for posterity. Rule 3. If its presence seriously worries you, phone a listed snake remover and keep an eye on it until he/she arrives. 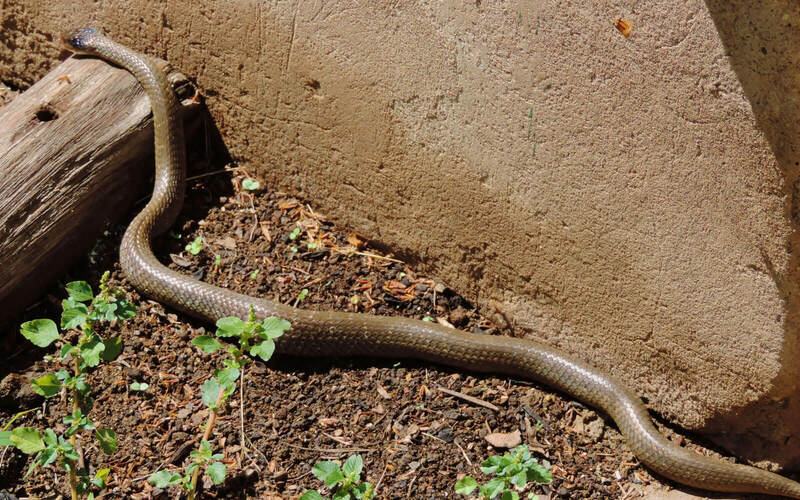 We live in a country that has snakes on its list of the fauna that resides within, so the chances of an encounter with the occasional snake in our lifetime are fairly good. Even if you see a particular species in the same vicinity more than twice in your lifetime, by the very nature of the animal, you could class that as a ‘common encounter’. 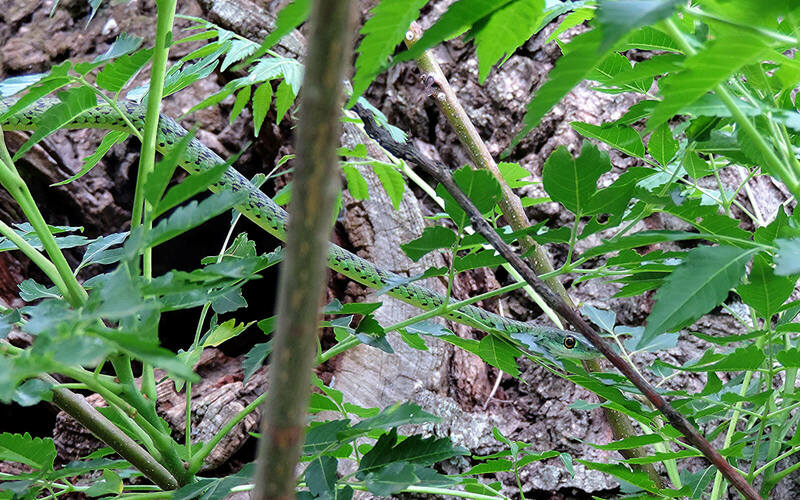 Snakes are the worlds’ hide-and-seek champions – ask anyone who’s ever tried to remove a snake. But they’re also clinical predators and biological-balance agents that we need to preserve, not kill. In this overview, please bear in mind that no matter what I say, nothing is cast in stone, there could always be exceptions so please don’t phone me if you have the dubious privilege of an encounter with a Night adder on your way to the bathroom at 3 a.m. during the coldest July on record. As they say – stuff happens. When can we expect to find snakes? Broadly speaking, some snakes are diurnal – daytime operators – some are nocturnal – night-time operators, some are terrestrial – ground dwellers, and some, arboreal – tree dwellers, some don’t really have a preference, so folks, day or night, there’s always the possibility of that 1000:1 chance encounter with a snake. Savour the adrenaline rush, many people in this world are not so fortunate. Here are 3 of the more common determining factors that might apply to the ‘when’. Within our blend of coastal forest and grassland, our coldest months are usually between May and September, and these could be looked upon as being the low activity months. 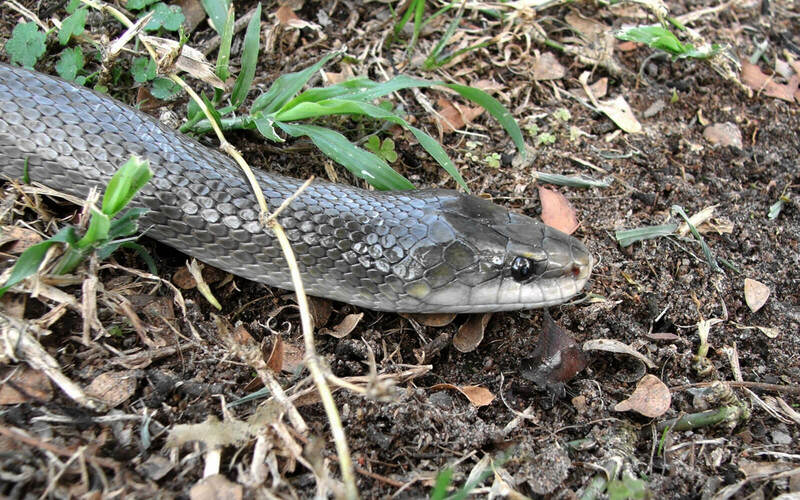 Being cold-blooded, snakes don’t like to move around in the colder months, and they’ll also have difficulty in digesting their food when the temperatures are low, so to cater for this drawback, they’ll bulk up on available food just prior to the onset of winter, so we can expect a spike in activity around mid-April, into May. Our east-coast snakes don’t really go into a total state of ‘hibernation’ in the accepted sense, as would their northern cousins. Ours are more inclined to aestivate – a term used for describing reduced activity when food resources are limited – where the animal uses very little energy by remaining immobile, so don’t totally discount the possibility of an encounter in mid-winter, because on a warmer than normal winter’s day, some snakes will grab the opportunity to get a bit of warmth into the body. The period falling between mid-September through to mid-April, traditionally the warmer months, would normally be a higher activity period, where we could expect more action, so switch on, wear closed shoes and carry a torch at night, because you’re now entering what we’d call, the Snake Season. Snakes are predators, so their activity peaks and troughs would have a direct correlation with the lifestyle and habits of their food preference, much of which, it stands to reason, will similarly peak in the warmer months. The food source itself, or the ‘magnet’, can also have its own habitat preferences, drawing it to a particular location. For example; local species that eat frogs and toads, such as Heralds, Night adders, Cobras, Vine snakes, Brown or Green water snakes, and Spotted bush snakes, will often, not necessarily always, be drawn to the proximity of a water source where frogs are likely to be found – rivers, dams, wetlands, your water feature in the garden, the pool area etc. Snakes cannot hear as we do, so they are not attracted to the croaking of frogs, but they will be attracted to not only the biome, but also the chemical clues that frogs emit in their travels – which tells us the main reason why some snakes end up inside our houses, catching frogs that are there, eating the insects that are also there while we’re sleeping. Scary hey? Similarly, a vegetable garden is a magnet for slugs and snails – the gardener’s nemesis – and if you have one, you could (should) quite rightly, expect an occasional visit from the Common slug eater. Whilst on the subject of magnets, do you honestly think the Spotted bush snake draped over the curtain rail has popped in for a cuppa? Heard of geckoes? In decades gone by, this would have had you bludgeoning the poor guy to death with a blunt instrument, setting its body alight, and burying the remains after sunset. I’m kidding of course, you’re an environmentalist. In the next section we will look at the importance of a breeding season in terms of snake activity, but we need to understand that in terms of food availability, their prey species also have breeding seasons, which will in turn, result in greater activity for them, consequently attracting greater attention from the limbless ones. One would probably think of birds in this instance; the beavering of weavers and other nest builders around springtime, is the harbinger of busier times to come. 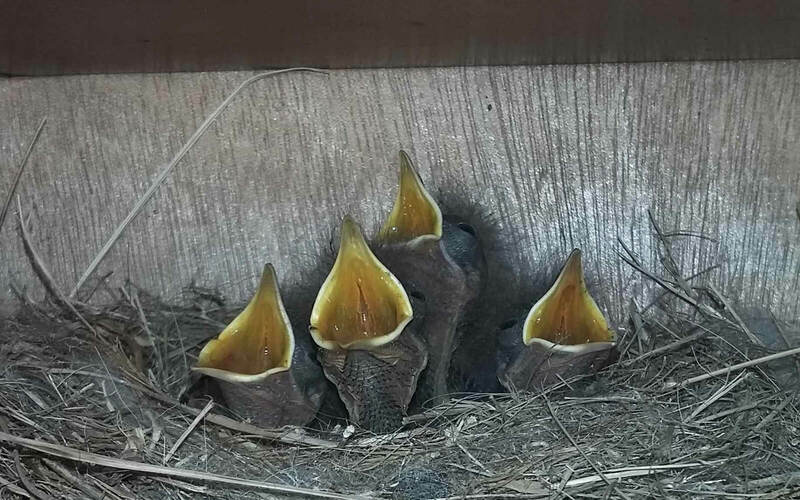 There would soon be eggs in the completed nests, thereafter the appearance of open-mouthed fledglings, wildly flapping their wings and screaming with their brightly coloured open beaks for more food as their almost demented parents dash about, trying to satisfy the insatiable appetites of their demanding children. Just like home huh? 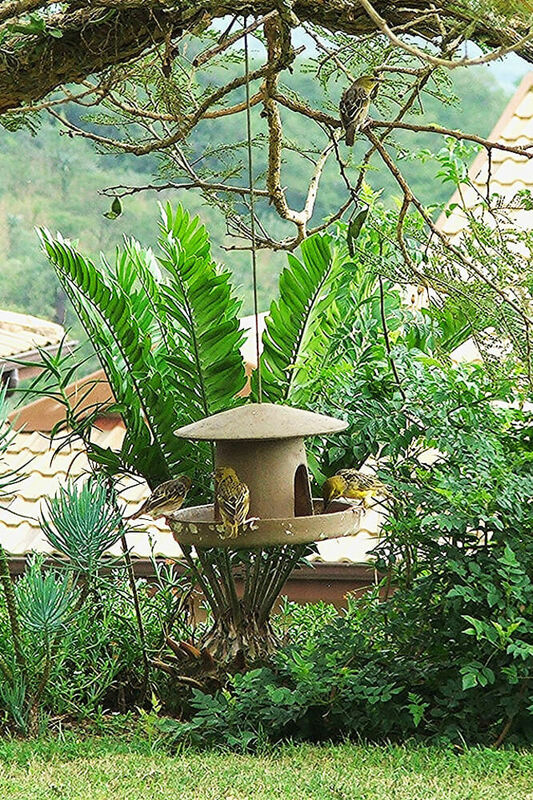 This activity would be a certain magnet for other local residents, the likes of the House snake, Vine snake, Boomslang, Mamba and Python, all of whom would relish the odd birdie burger. We’re also likely to come across the cunning Southern brown egg eater in the above scenarios. 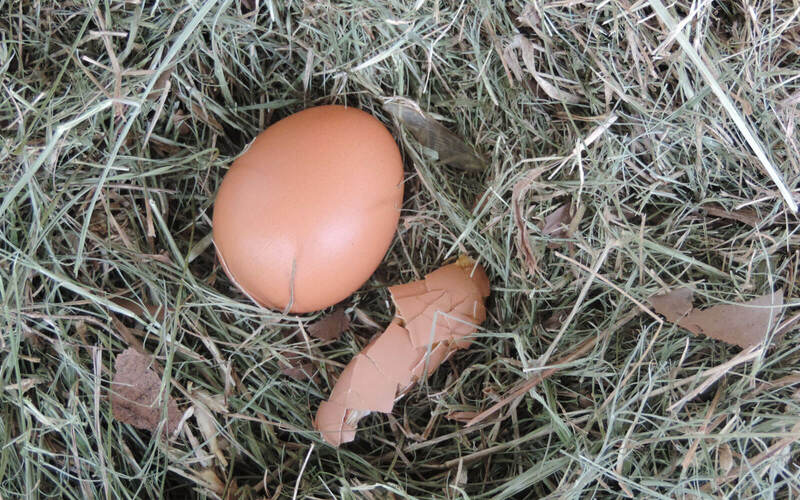 Those funny flattened eggs you find occasionally up in the pigeon loft? Remember this; if you put out the food, you’ll get the visitors. Ask any vervet. In addition to all that we need to consider, we can’t ignore the additional pulling power of those man-made drawcards – the atrium you built for breeding Quails, the rat-infested dungeon you refer to as a ‘storeroom’, the pile of broken household appliances and assorted detritus you pile against the garage wall for just-in-case. 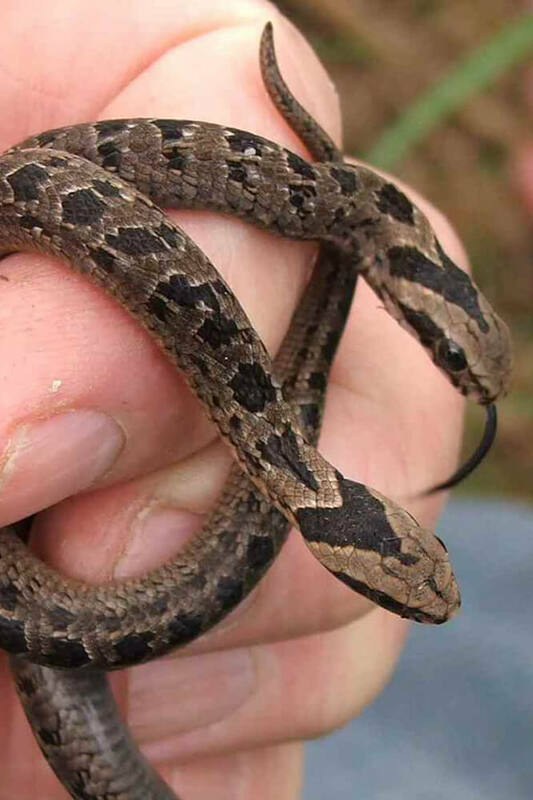 Folks, if you’ve got frogs, rats, mice, bird feeders, Loffelstein walls and other interesting stuff around your spot, you’re guaranteed to get more than the occasional visit from a snake. You might even get a permanent resident or two. With few exceptions, the breeding generally takes place in the latter part of winter, and into early spring. This could also be termed a reasonably busy period, when females are sending out pheromonal signals, followed by a noticeable increase in numbers in the form of sundry males from other areas, that are responding. Snakes generally do not build long-term relationships by pairing off as would many other animals, so there will certainly be an increase in activity at this period, along with a bit of same-species how’s yer father and some male vs male arm-wrestling thrown in for good measure. This activity could be likened to a gathering of every dog brand in the neighbourhood, responding to a come-on from the local hussy who’s in oestrus – the difference being that the snake pheromones are very species specific. Towards mid-summer, any mass-hatchings might cause concern for the casual observer, as they’ll result in an activity peak as the freshly hatched youngsters start looking around for places to live and hunt. That is of course, provided they don’t get eaten first – this is where the hunted becomes the hunter. Where are we likely to come across them? 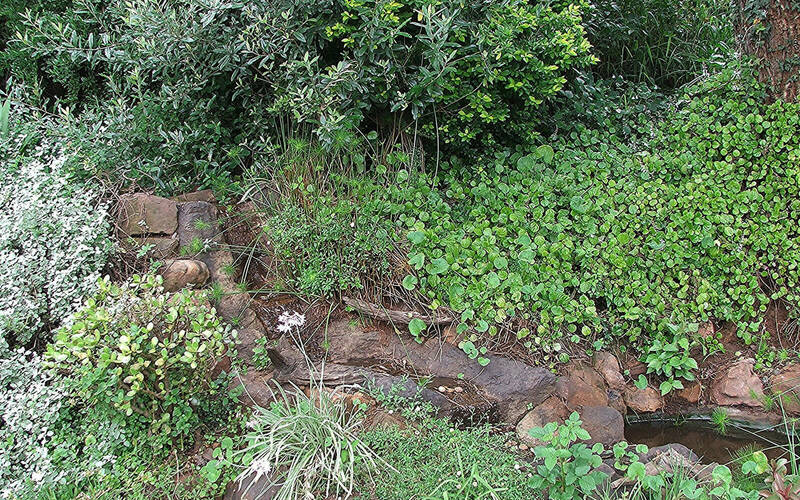 Aside from the occasional specific habitat exception – for example the cliffs and gorges found in the Inanda, Kloof and Winston Park areas, preferred by the Spotted rock snake with head adaptations for the habitat – the other species discussed could probably be encountered in most places within the region. 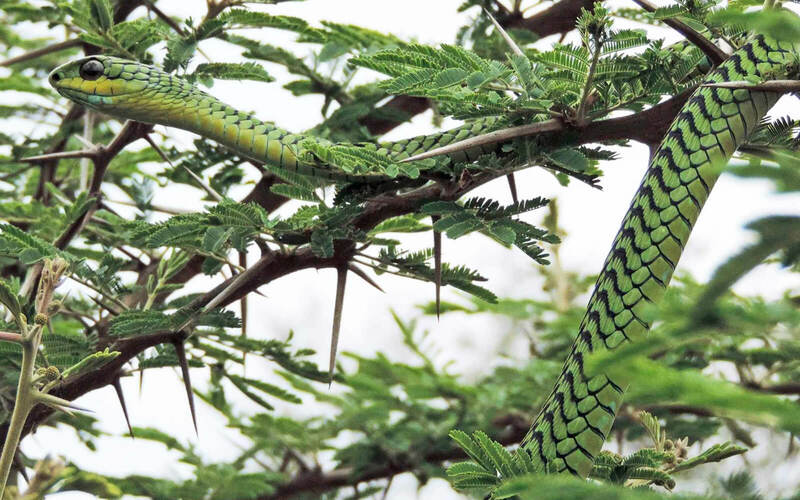 Although we have at least 4 varieties of green snake locally – including the male Boomslang – the much-maligned Green Mamba really only inhabits areas of the narrow coastal forests within 4-5kms of the coastline, and, as with others that could be classed as highly unusual finds well out of their known ranges, these oddities are more than likely to have been accidentally imported, usually by vehicle – probably emerging from the vehicle chassis or the pieces of gnarled wood, weathered rocks or stunning aloes you picked up in the Berg. Perhaps even the load of rubble you brought in to fill up a donga. I removed a green mamba from a vehicle up in the Highflats area (where it certainly doesn’t hang out) and it transpired as we discussed the options of origin, that the driver of the vehicle had spent the day before with friends down on the coast. I’d guess that the snake had taken a liking to the temporary accommodation on offer in the spare wheel well. What species can we expect to find in the Highway area? 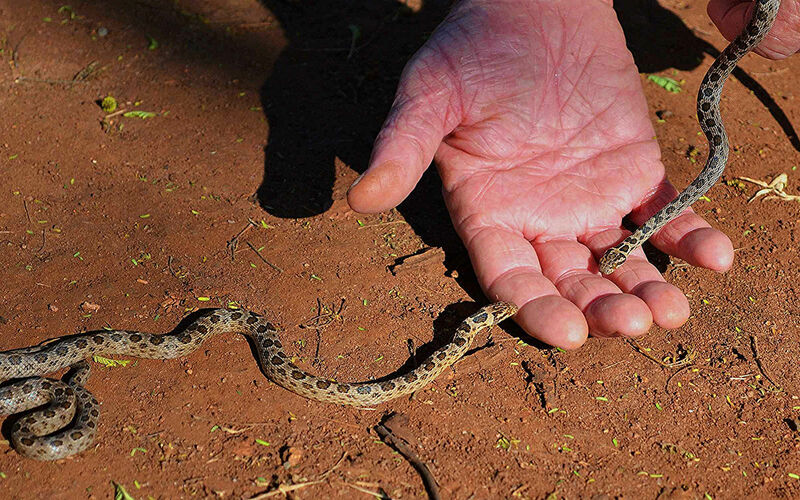 We’ll certainly find a number of the nationally listed 150 or so species, including the Puff adder, Boomslang, Vine snake, Black Mamba, and Mozambique Cobra, which are all classed as dangerous. Don’t forget the less dangerous but nevertheless medically important ones such as my favourite, the Night adder, and the rather heavily ‘armed’ little Stiletto snake. Some of the species recorded in the early distribution lists, some dating back to well before 1900, might have been misidentified by those reporting their presence. Some books indicate a general distribution area – showing where they might be found – and other publications show only specifically recorded locations. 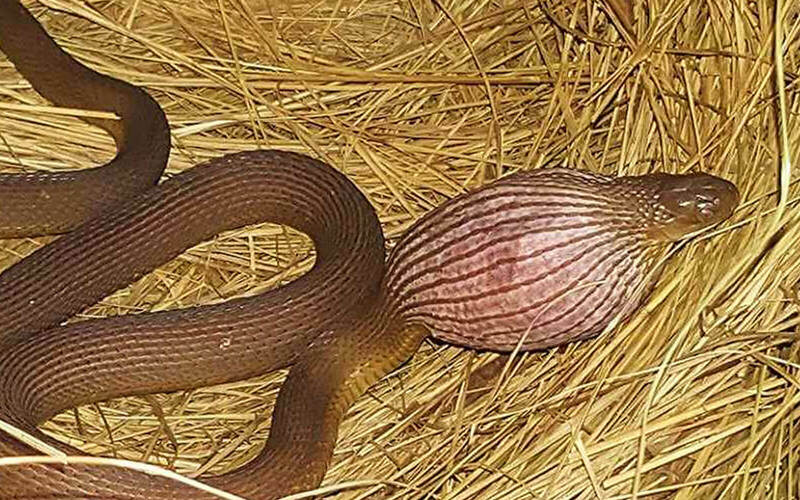 Names like Mole snake, Puff adder, Mamba and Brown house snake, were often given to anything that looked remotely similar, and these species were then recorded as factually occurring in the areas listed. Legends are born as the result of the misidentification of such things as black Mambas, which were probably Heralds or Olive house snakes – the confusion arising possibly from the colour similarities or poor interpretation of a google searches, a common reason nowadays. 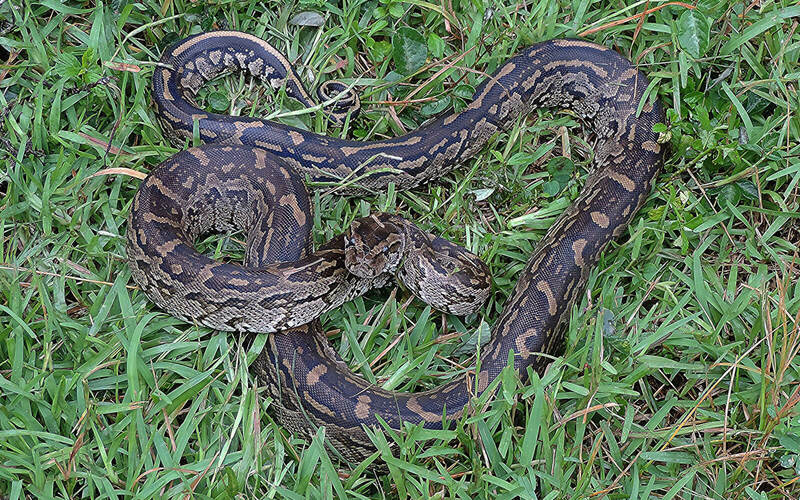 People often confuse Puff adders with Night adders – which both puff loudly when warning – and Mole snakes with Brown house snakes. Although this confusion is understandable because we’re not all experts, it would be good – and educational – if homeowners, especially those who enjoy the outdoors, would invest in a recent edition of a snake guide book, to at least sharpen up on their local species, and find out what it is that lives under the dog’s kennel or inside the square tubed chassis of the fancy driveway gate. Pat was born in the UK, educated and brought up in Rhodesia/Zimbabwe, and came to South Africa in 1983. He developed an early interest in the study of the behavioural aspects of insects and animals, rather than the deeper scientific side, and he’s worked with snakes for most of his life. 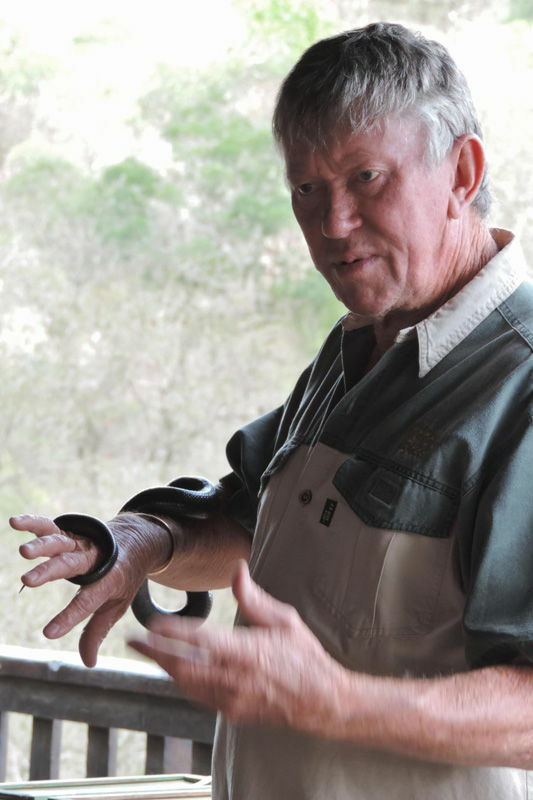 Pat conducts educational walks and talks throughout SA and into neighbouring countries where snakes are grossly misunderstood and needlessly killed. 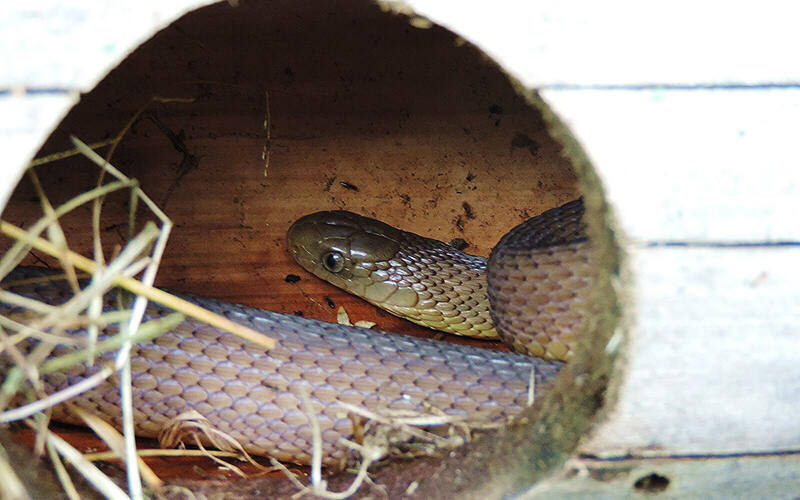 He writes articles for a number of publications, and has written the book ‘Getting to Know the Neighbours’, which is all about understanding snake behaviour and is aimed at teaching others how to come to terms with them.